Orchids are very popular at the moment, and we know why. They are beautiful. They are colourful. They are exotic. They remind us of sunshine and warm weather. And they are extremely long lasting. The “Swirling Orchids” Arrangement brings out the beauty of these magnificent flowers. 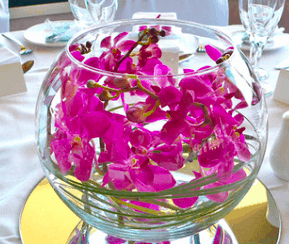 Brightly coloured imported Dendrobium orchids are swirled inside a large clear glass bowl. They are in water but the blooms float above and show off their magnificent colours and delicate petals. An impressive design. And with the protection of the glass vase, the flowers inside will last for a very long time. This is a large bowl – approx. 12 inches in diameter and the arrangement is suitable to grace a dining room table, or desk. Note – the colour of the orchids will vary depending on the season and availability. They come in magenta, white, blush, blue, green. Our designers will create the arrangement using the colour of the day.